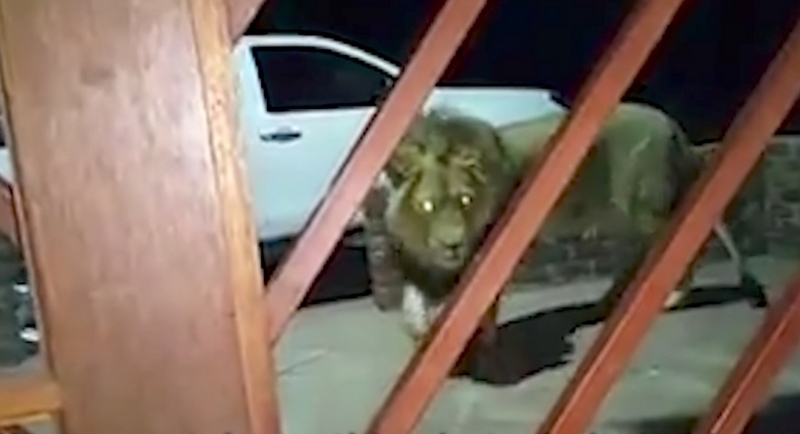 WATCH 'n boer maak 'n plan: Farmer swaps guard dog for a guard lion! WATCH ‘n boer maak ‘n plan: Farmer swaps guard dog for a guard lion! In a video posted to Facebook by Elardus de Lang – which has gone viral – a farmer is seen using a male lion as a security guard on his property, reports Jacaranda FM. “Farm attacks and murders are at an all-time high and it seems like farmers are going over and beyond in order to protect themselves,” says the radio station. The man in the video states that the lion is safely enclosed during the day and at night he is set free to be on guard. Listen as Phat Joe speaks to the farmer claiming to use a lion as a security guard on East Coast Radio. The ‘boer’ talks about his ‘big cat’ that is getting lots of ‘Lieuwws’ on the social media. The lion seems playful, as Phat Joe notes. “Security has become the essential thing to have on South African properties these days, especially with the high crime rate,” says East Coast Radio. The farmer, Handrik, says of his plaas security: “Hakuna Matata, if you see a lion you will kaka your pants, so don’t break onto my farm” – before hanging up on Phat Joe. “Some choose to use alarm systems and others tend to use security guards or armed response for protection. However, this farmer has taken matters of security into his own hands,” says the show. Some have taken to social media to applaud the farmer for his actions, while others have voiced their concerns over it not being right that the lion should be used for protection, comments the station.